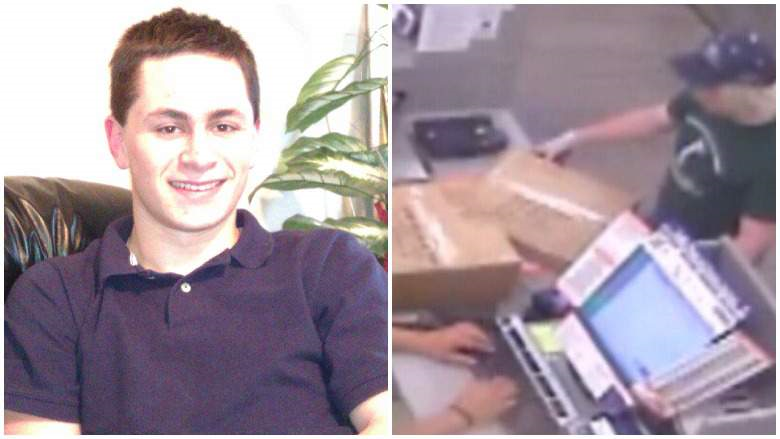 Austin Police identified the bombing suspect as Mark Anthony Conditt of Pflugerville, Texas. According to Truthfinder. com, Conditt is 23 years old. Austin Police say the bombing suspect is dead. Authorities were able to find his car at a hotel in Round Rock, Texas last night. Austin Police Chief Brian Manley said as the suspect’s car started to drive away from the hotel, police followed it until the car stopped. As Austin P.D. SWAT approached, the suspect detonated a bomb inside his vehicle and killed himself, Chief Manley said. Chief Manley said although Conditt is dead, it’s still unknown where else the he may have mailed or placed package bombs. Chief Manley and the FBI urge the public to remain vigilant, not touch nor move suspicious packages and call 911 or local law enforcement to investigate. On March 20, the Austin Police, FBI and ATF confirmed two packages found at two separate FedEx facilities in the Austin – San Antonio area on Tuesday were connected to the 4 package explosions that happened between March 2nd and March 18th in Austin. On Tuesday, one package exploded at around 12:25 a.m. in the FedEx facility at 9935 Doerr Lane in Schertz, Texas. An employee was treated and released. Around 6:19 a.m., Austin Police, the FBI and ATF responded to a suspicious package at 4117 McKinney Falls Parkway in Austin. Investigators determined it had an explosive device and disrupted it. No one was hurt. 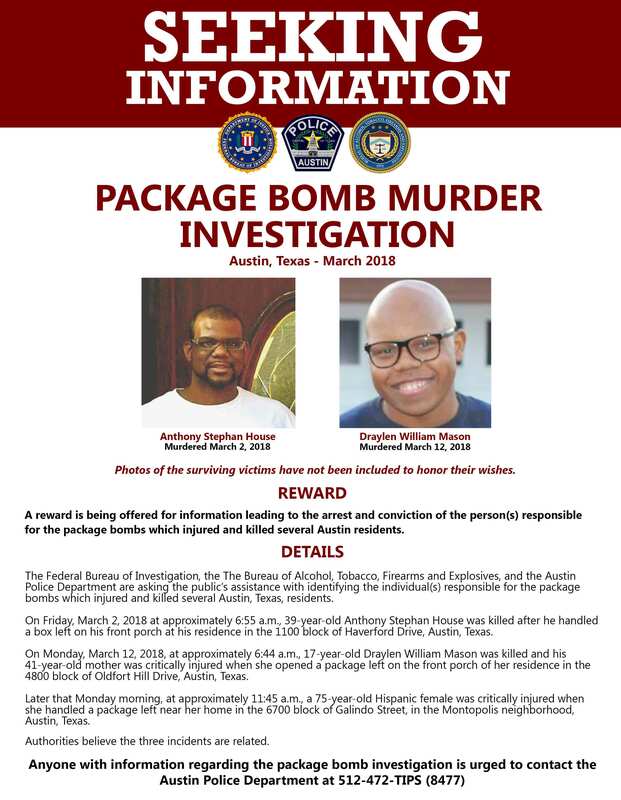 If you have any information regarding this package bomb investigation, call the Austin Police Department at 512-472-TIPS (8477) or 1-800-893-8477. Authorities advise the public to remain vigilant and not touch, move, handle any suspicious or unknown packages and call 911 or local law enforcement. FBI San Antonio tweeted a fifth package explosion early this morning at a FedEx facility in Schertz, Texas. On Facebook, Schertz Police said the investigation happened in the sorting area of the FedEx facility in the 9900 block of Doerr Lane. One person was treated and released at the scene, according to Schertz, Texas police. Austin Texas Police, ATF and the FBI need the public’s help in finding and arresting the person or people responsible for recent package bombs that hurt and killed several Austin residents. Authorities suspect a serial bomber. The fourth package bomb explosion happened Sunday night injuring 2 people in southwest Austin. As of Noon Monday, Austin Police were asking residents in the Travis Country Subdivision to stay put. On Monday night, Austin Police tweeted entry to the Travis Country neighborhood is limited while the investigation continues. On Monday, Houston Police Chief Acevedo also tweeted 2 EOD technicians and a EOD K-9 unit from Houston will help in the investigation of the recent bombings. The San Antonio, Texas police Department also is assisting with the investigation. Austin Police Chief Brian Manley, Special Agent in Charge Christopher Combs, San Antonio FBI and SPAC Frederick J. Milanowski, the Houston Field Division of the Bureau of Alochol, Tobacco, Firearms and Explosives announced a reward of up to $100,000 for information leading to catching and convicting the suspects responsible, according to the FBI News Release. Texas Crime Stoppers also has a $15,000 reward. The total reward money is $115,000, Austin Police Chief Brian Manley tweeted. Authorities believe the first 3 package bombs that killed Anthony Stephen House on March 2 and Draylen William Mason on March 12th and injured 2 people are related. The FBI says House, 39, was killed after handling a box left on his front porch at around 6:55 a.m. on Monday, March 2, 2018. He lived in the 110 block of Haverford Drive. On March 12th, Draylen William Mason, 17, was killed and his 41-year-old mother was severely injured after his mother opened a package left on the front porch of her home in the 4800 block of Oldfort Hill Drive around 6:44 a.m.
At around 11:50 a.m. on March 12th, a 75-year-old Hispanic woman was critically hurt after she handled a package left near her home in the 6700 block of Galindo Street in the Montopolis Neighborhood in Austin. This entry was posted in Asian Community, Asian Community Alert, Asian Community Houston, Community Alert, Crime Alert, Crime News, FBI News, Harris County News, Houston News, National News and tagged Austin Package Bomb Explosion Investigation, Austin Texas Package Bomb Investigation. Bookmark the permalink.